The true zero order waveplate is designed to highly accurate application. Its thickness is very thin(less than 0.1mm) which make the true zero order waveplate excellent in temperature,wavelength and incident angle bandwidth. To suit different applications,our true zero order wave plates are classified into Cemented true zero order waveplate by Epoxy,Single plate true zero order waveplates,Telecom true zero order waveplate. Cemented zero order waveplates are constructed of a true zero order waveplate and a BK7 or Fused Silica substrate. The waveplate is very thin and easy to be damaged, the BK7 or Fused Silica plates function is to strengthen the waveplate. On the other hand, this glass plate limits the cemented true zero order waveplates to low and medium laser power application. Other wavelengths added from time to time upon requested. In order to enable the waveplates suitible for high damage threshold(more than 1GW/cm2) appplication,ULTI Crystal provides a single plate of true zero order waveplate. Considering to the thickness of this waveplate is very thin so that it be very difficult to handle for assembled,so we are stongly recommend to use mounted single plate true zero order waveplates. To suit telecom special applications,we are designed and support Telecom series of true zero order waveplates. The primary wavelength is 1550nm although other wavelengths are available. The benefits are accuracy with very short optical path length, excellent temperature stability and extended bandwidths. Each surface of the Waveplate is coated with an anti-reflection coating to maximize the transmission at the specified wavelength. 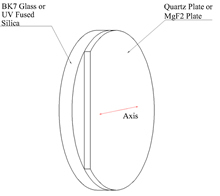 We offer 1/2 wave,1/4 wave,3/4 wave and 7/8 wave true zero order Waveplates at several telecom wavelengths, and the ¾ wave can be used as a quarter Waveplate with a sign reversal. ULTI Crystal has a stock position of a wide variety of telecom True Zero Order Waveplates in the telecom band, from 1500nm to 1600nm. »| We are committed to support a fast delivery to customer.Generally,we can delivery any wavelength for standard size within 10-15days if no stock. »| Above prices lists are all based on QTY >=20pcs. If you need prices for <20pcs or OEM prices,please contact us to get more information. »| We hold a large stock for most standard size with standard wavelength,it will satisfy most applications and test. Please contact us for checking our stock situation and information. »| Custom retardation and size is avaliable upon request, and please advise us your central wavelenght when you order our standard true zero order wave plates. »| We are support mounting and unmounted true zero order wave plates,you could make choice as your applications. »| These products can be used for the beams which wavelengths are in +/-1% of rated wavelengths. »| The surface flatness is the reflected wavefront distortion of the surface before coating. »| Be sure to wear laser safety goggles when checking optical path and adjusting optical axis.